Meet John – Who was he and why does it matter? I want to introduce you to a friend…well, probably, more like an acquaintance, but someone that I love and appreciate very much. He is not here today, but if he were, I am sure you would love him and he would love you. He is an average looking man, has a manly beard, and wears the rugged outdoorsman-look very well but he is a softy on the inside. You wouldn’t know it from looking at him, but this guy can well up with tears at the drop of a hat. He is probably one of the most loving guys you could ever meet. His dad, Zebedee was a wealthy man. The waters had always been kind to him, yielding what he needed to be one of the most successful fishermen on the Sea of Galilee. He was somewhat wealthy (Mark 1:20; Luke 5:3; John 19:27) and hoped that his boys would take over the business someday. He didn’t let James and John get away with much; he taught them that success didn’t just happen, but it comes though hard work and dedication. When John was not on the lake, he was in the Bet Sharim or otherwise known as the “House of Life”. This was a small room attached to the synagogue where he would learn from the Jewish priest from the Pentateuch, the first five books of the Bible, and occasionally from the Psalms. He would also study the Hebrew language in order to read and write on his own. Little did he or his family know, John would be quite the prolific writer someday – odd for a little fisher-boy from Bethsaida. Yes, they were Jewish – “People of the book” they were called. The loved the Bible and practiced the traditions and observations written in it. These written and oral laws became the foundation of the Jewish faith. Though their people had been captured and exiled many times from their homeland of Israel, they were not in fear of that anymore. Rome had taken over and was not only ruling, but also protecting their land. Though there always seemed to be some conflict in the Jewish church, Zebedee couldn’t have been more proud to be raising his son in the land their faith was founded in. One day, when the boys were now grown men in their early twenties, they were out fishing as they had done hundreds of days before. They two of them, James and John, had been hearing about this prophet who wondered in the wilderness proclaiming that the Messiah was coming. Neither of these things were new to them—a prophet, a man claiming to speak on behalf of God—or a man saying the Messiah was coming. You see, in the Jewish faith, they always lived with a hope and expectation that God was going to save His people. The read about it and studied it in their Jewish school. They sang about it in their Sabbath day services. Being staunch Jews, they longed for the Messiah. Yep, this prophet didn’t just speak, but he would call those he spoke to into water to be dipped or immersed in water. A sort of object lesson. He kept saying, “Repent! The Kingdom of God is at hand.” The water immersion as a way that people would physically get wet and say, okay, I repent, I wash myself of my sin. John and James no doubt had to have long talks under the starry skies of Galilee wondering if there was any credibility to this cleansing that John the Immerser, the Baptiser, was calling them to do. The Ideal of being immersed in water wasn’t new to them. Jews had used ritual bathes called micvah’s for centuries. Before making a sacrifice to God, they would go down into these bathes to get clean, or at least symbolize that they were leaving their sin and their past behind. This was the same thing this new strange prophet was doing, except it wasn’t by the temple and it wasn’t in a micvah. He used just about whatever water he could find, mostly making use of the large flowing river flowing down the middle of the country called the Jordan. “I don’t know… but I think it is odd that eats grasshoppers and honey,” James replied back. Curiosity gripped John’s soul, or maybe you could say it was a calling, but whatever it was, John couldn’t stay away. One-day John and James packed a few fish and some loaves and headed out to see this John guy for themselves. Sure enough, there he was, wearing nothing but animal skin. He stood in the murky water of the fast-flowing Jordan preaching to the crowd on shore. At the conclusion of his sermons (if which there were many in a day) he would invite people to come into the water to be baptized as a symbol of repentance. This dirty, and seemingly crazy man, was persuasive. His words gripped your heart as if they were from God. John son of Zebedee grew convinced that this really was a prophet and quite possibly could be the last prophet before the Messiah comes. John was all-in. He bought it, hook line and sinker. It only took one day with John the Baptist to convince him that he wanted to hang up the fishing job for a while and follow this man. James felt the same way. You can imagine the late night conversation by candlelight back in Bethsaida with their father. They told him that they were going to become disciples of John the Baptist and leave the family business, at least for a while. Their dad’s disappointment had to be felt by the whole family. I am sure they didn’t’ want to let their dad down, but they also realized this may be a once in a lifetime opportunity. Their dad was proud they held to the faith so strongly, but why couldn’t they just stay there and hear about this John guy from afar? I am sure it took some mom-help to get dad to be okay with it. So with a dad’s perplexed and perhaps broken heart, they went to become disciples of John the Baptist. Their mission was clear: prepare the way for the messiah. Little did they know, they grew up at nearly the same age (about 6 years younger), as a part of the same generation, under the same political environment, with the same Jewish rituals, only 40 Kilometers (about 24 miles) from Jesus in Nazareth. Look at John chapter 1 with me. John had let his dad’s business and all that was familiar to him. He wandered by the Jordan river, in the wilderness of Israel, helping a traveling preacher hold daily revival services. This was not just any preacher, but was the front-runner for God. It was a moment that John will never forget. He even remembers the exact time it happened, “about the tenth hour” which was four o’clock in the afternoon. “Behold the lamb of God!” The Immerser cried out. With those words, John, James, and the other disciples of John’s turned their allegiance to Jesus. They stayed with him, by his own invitation, for that night and that was the beginning of a thrilling life as Apostles of Jesus Christ. There are so many details about this man, John’s life that I could tell you, but It would take months to unpack them all. Fortunately, for those of us who know Christ, we will get to know this man personally someday in eternity. However, over the next few months we are going to get to know this man and his heart very well. He was a man used by God in great ways and he left us some writings that are precious and relevant to our lives today. Though they are God’s words, John was the instrument God used to write them and who John is was important enough to God to allow his “ethos” – his nature, personality and passion – to breath through onto the pages. John lived until he was 94 years old and died a natural death. He was the only disciple that didn’t die a martyr’s death for the faith he had in Jesus Christ. He wrote five of the 27 books in the New Testament, four named after him – Gospel of John, 1, 2 and 3 John and the final being Revelation, the last book of the Bible. He was one of the pillars of the faith after Christ rose again and helped to establish the Church. He was a close associate of Peter in the book of Acts. Because of the religious controversy between Jews and the early church, he was exiled by the Romans to the Island of Patmos off the coast of Israel to keep peace on the mainland (Revelations 1:9). That was where he wrote his last letter and finished his last days. This man experiences deep grief, loss, fear, faith, doubt, pain and joy. He is like us, just an ordinary person transformed by an ever-powerful God for extraordinary purposes. Who John is matters to us because through his life we can identify with him and see the gospel through him. God chose to use him to speak to us, we chose to listen to him to hear from God. The more you identify with the author and understand the context, the more the Bible comes to life. Though we are separated by two thousand years, our core problems are the same and our solutions are similar. We all need Jesus; no one got that more than John. Written for Believers in JC who are connecting in community together. Structured around two main themes: Faith and love. Applied by living in like Christ. a constant comparing myself to JC—WWJD. John experienced that God’s love will never leave us the same. Some see that as a bit prideful, “The one Jesus loved,” or “Jesus’ favorite.” But I sense as he wrote there was a feeling of, oh how he loved me… and I didn’t deserve it. I believe that John was overcome by the realization that God loved Him so much that He gave him Jesus. What a gift of love. I was the Galilee region with one of my closest friends, Guy. He is an Israeli man and the guide who leads with me when I am in Israel. One day, as the boat engine was turned off and we were standing on the deck of a boat on the Sea of Galilee he said, “Pastor Josh, come here, I have to tell you something…” He proceeded to say, “God loves me so much today. I can feel it.” Then said in his broken English, “I am telling you, he loves me more than anyone else.” Though his words sounded unfair, he was trying to use English to say, ‘God’s favor is on me and it doesn’t make sense…’. It reminded me so much of John’s words, “The Beloved Disciple,” as John called himself, “The one Jesus loved.” He had a sense of the Love of God in His life that was so real, present and undeserved. John got the fact that we would not know the love of the Father if it wasn’t for the fact that the Son came to unite us with Him as perfectly one. Identify with John for a minute: He was a man moved by the love of God, shown through Jesus. Though he may have been a burley fisherman, he was a lover. We see him even reclining at the table on the night Jesus was taken to be killed, and laying on Jesus chest. One guy doesn’t lay on another guy’s chest unless you are the most bonded of men. John loved Jesus and Jesus truly loved John. To develop an appetite for heaven, we do no feast on the things of this world. We are rather predicable humans—the more we have of something, the more we want of that thing. We train our emotions, taste buds, eyes and minds to go after something the more we consume it. That last statement should cause us all to pause and ask, do I love the world in some areas more than I love God? What would it take for me to change my perspective from loving God’s good gifts more to loving the giver of those gifts? Not easily done, but something we will talk about more in the coming weeks. Our first reaction should not be to defend ourselves but to give to others. My brother-in-law Micah embodies this the best of anyone I know. He is consistently giving away all that he has for the sake of others. He doesn’t view his money or possessions as his own, but merely a means of expressing love to others. He is constantly serving, giving, praying and empathizing with those who are around him—not necessarily poorer than him, just simply around him. He is an attorney not in it for himself, but using his life to bless others. That is what Christ calls us to be like in 1 John. This small book communicates that if we do not love, we do not know God. This is not a light statement, look at 1 John 4:8, “Anyone who does not love does not know God, because God is love.” John understood that all love comes only from the source of love. If you do not love—meaning that you truly express unconditional love—you do not know God. John wrote just a few verses later in 1 John 4:11, “Beloved, if God so loved us, we also ought to love one another.” The mere outflow of God’s love in us is God’s love through us. This is why at Grace Chapel we talk about God working “In us and through us.” It starts with me and what God has done for me through the Cross of Christ. His continually love for me through care, teaching, encouragement and spiritual life should merge into a river of overflowing blessing to others. The first two chapters of John deal with Christian Ethics—the way we should live with integrity in a world that doesn’t always have it. John uses an analogy here and in His gospel of the light. He refers to Jesus as the light of the world in John 1, “Jesus is the Light of the world, and the darkness did not understand it.” He also records Jesus saying He was the light in John 8 and 12. Walking in the light is to walk blameless, first because we have been forgiven, but secondly because we are striving to obey God’s commands. Our obedience and purity is the key to fellowship with God and with others. John recorded Jesus as saying, “If you have my commandments and keep them, then you love me” (John 4:21). We don’t have corrupt or lax morals like the world (or the “Darkness”). We live a life of integrity, not out of obligation, but out of love for God who first loved us. John was a man who found great security in who he was in Christ. We know that his move from being a disciple of John the Baptist to Jesus Christ was a move that gave him great purpose, security and calling. He and James were called “The Sons of Thunder” in Mark 3:17, possibly because of their zeal, or their booming voices or their righteous anger. He was confidence in the security he found in Christ. He was giving eternal purpose; of which he spoke of often. He wanted everyone to have the same kind of eternal security in salvation in Jesus that He had found. This will be very clear to you as we study 1 John; he is not a wimpy salesman, but a satisfied customer who wants everyone to know the love of God He found in Christ. He also understood his unique wiring and experience with Christ and had security in it. He gave a different perspective than the other gospel writers. He wrote Revelation, which is unique on its own. How freeing it is when you find that you have a unique calling and you are not here to compete with anyone else, but simply need to be the best you can be in your niche. John got that and lives secure in that, having great impact through that. In closing, I want you to get a main theme that we will see many times throughout this book. That is, the key to meaningful connection with others is Christlikeness. 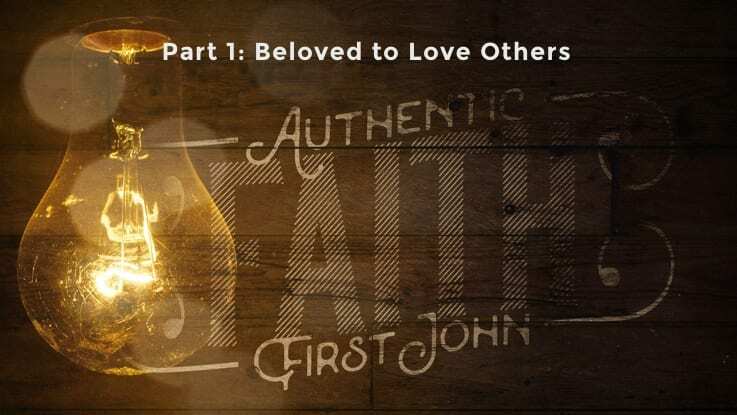 John loved Jesus and wanted to be like Him. He understood that if we were going to be a loving community we have to be in Christ and like Christ. When you realize, that you, like John, you have been so loved, you make it your goal to love like Christ. Charles Spurgeon once wrote this: “A soul under special manifestation of love weeps that it can love Christ no more. Mr Welch, a Suffolk minister, weeping at a table, and when being asked the reason of it, answered, it was because he could love Christ no more.